If you're looking for an attractive furniture piece that can serve double duty as a work surface, you may want to consider investing in a hutch with a drop down desk. This type of combination storage and work unit can be an attractive addition to any room of your home. What Is a Hutch with a Drop Down Desk? 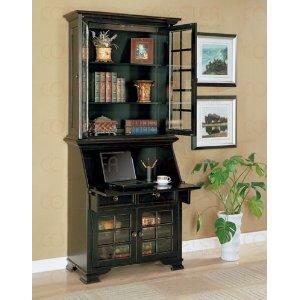 A hutch with a drop down desk is a relatively tall, thin furniture piece that is designed to back up to a wall. It typically has one or two shelves at the top and a panel across the middle that can be pulled out to become a work surface that can be used for writing, typing on a laptop computer, reviewing reports, paying bills and other tasks. Some units have open shelves while others have glass doors that can be closed and opened, yet still allow the contents to be visible. In some cases, additional open or closed storage space is available beneath the desk panel. This type of furniture piece is an excellent choice for individuals who need to set aside space in their den, living room or bedroom to take care of household finances or work projects. Rather than having to leave papers out in the open where they can create a cluttered appearance or accidentally get thrown away, they can be stored inside the closed desk panel. When the panel is closed, the hutch simply looks like a lovely piece of furniture. However, when you're ready to work, simply pull down the panel and everything you need will be right at your fingertips. When shopping for a hutch with a drop down desk, it's important to consider the décor of the room where the unit will be displayed. You will want to choose a wood and stain type that is very close to the other wooden furniture in the room, as well as a style that is consistent with the overall look and feel of the space. While you may have do a bit of shopping to find a piece that blends perfectly with the other items in the room, the time you spend looking for the right hutch will be well worth the effort. In addition to looking for a hutch that is visually appealing and fits well in the room where you will use it, it's also essential to consider how you will use the piece. If you're likely to spend a good bit of time working on the built-in desk, make sure that that the work surface is wide enough and the right height for you to sit comfortably while you are working. Be sure that there is plenty of leg room beneath the pulled out desk to keep you from constantly kicking the bottom of the unit. This will protect your toes as well as keep you from scratching the surface of the hutch or damaging items that are stored on any low shelves the unit may have. Most furniture stores, home improvement centers and office supply stores are likely to carry several hutches that feature drop down desks. Visit any local furniture stores that carry home office furniture as well as stores like Home Depot, Lowes, Office Depot and Office Max. You may also be able to find these types of pieces at warehouse stores like Sam's Club and Costco. Amazon.com is also a good resource to check, especially if you are open to purchasing a ready to assemble piece. If you are open to purchasing a previously owned piece, consider checking local consignment and thrift shops as well as classified ad listings. You just might find a great deal on the perfect hutch!